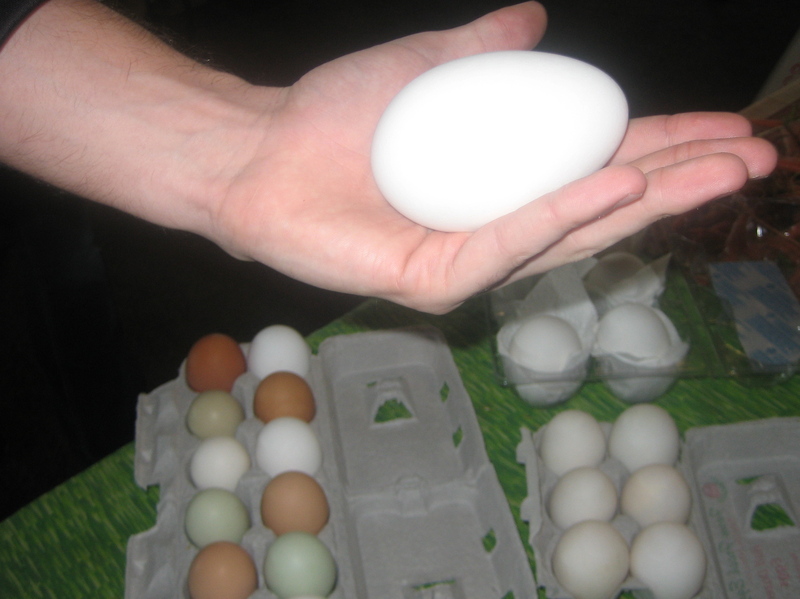 At the Green City Farmer’s Market last weekend they were selling Goose Eggs. Huge! The Winter Farmer’s Market is alongside the North Pond in Lincoln Park. Last year I remember seeing these big broken shells around the pond, a “goose control squad” was piercing the eggs to control the goose population. Maybe we should start using them? 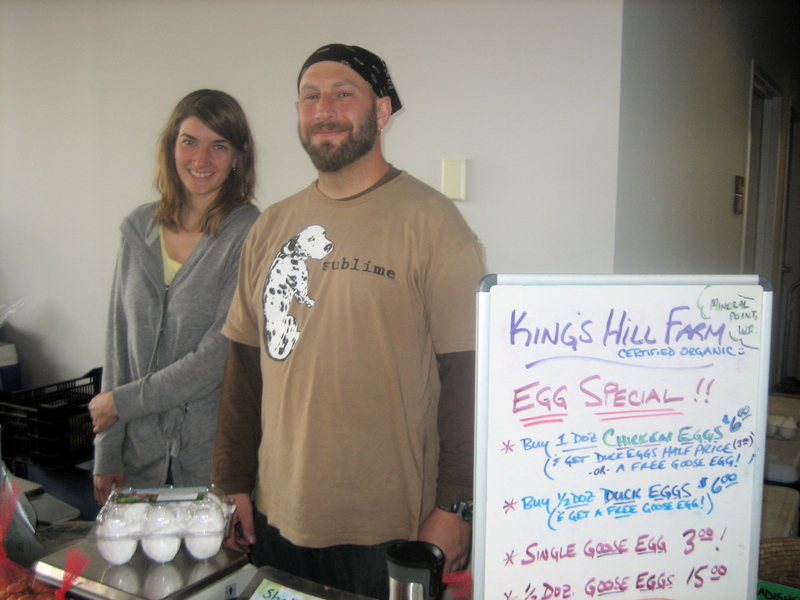 I bought some from Mike Steckling of King’s Hill Farm. 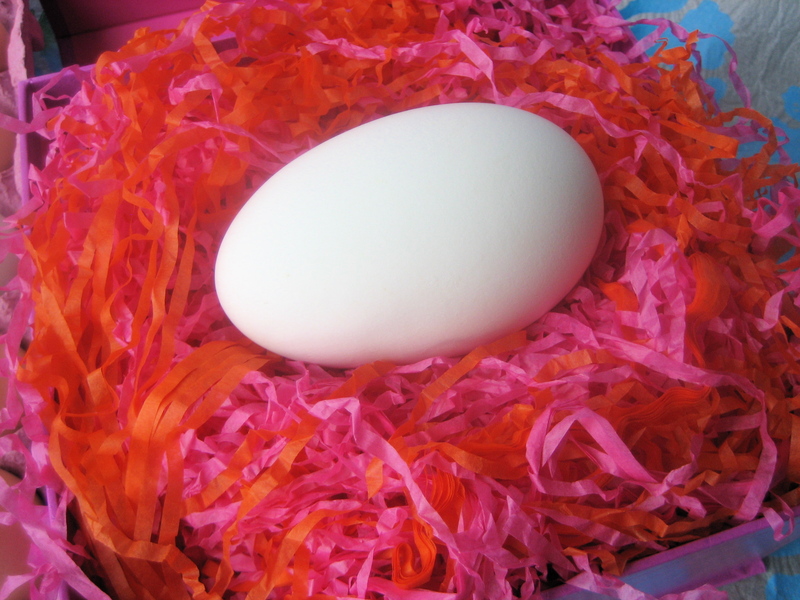 I thought it would be fun to bring a Goose egg or two for coloring Easter eggs. And have the Easter Bunny hide it as a grand prizewinner. 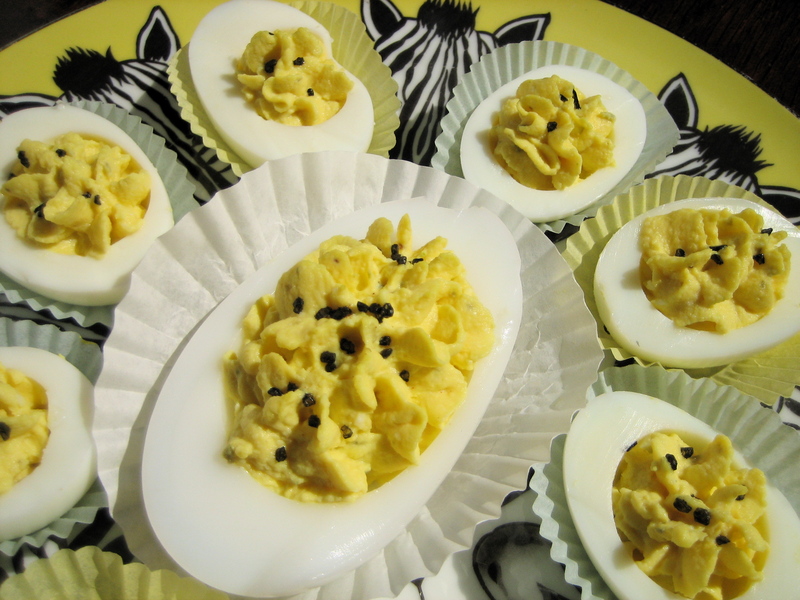 A Deviled Egg Party Appetizer with that giant goose egg deviled in the center. Stuffed eggs have their roots in ancient Roman recipes. 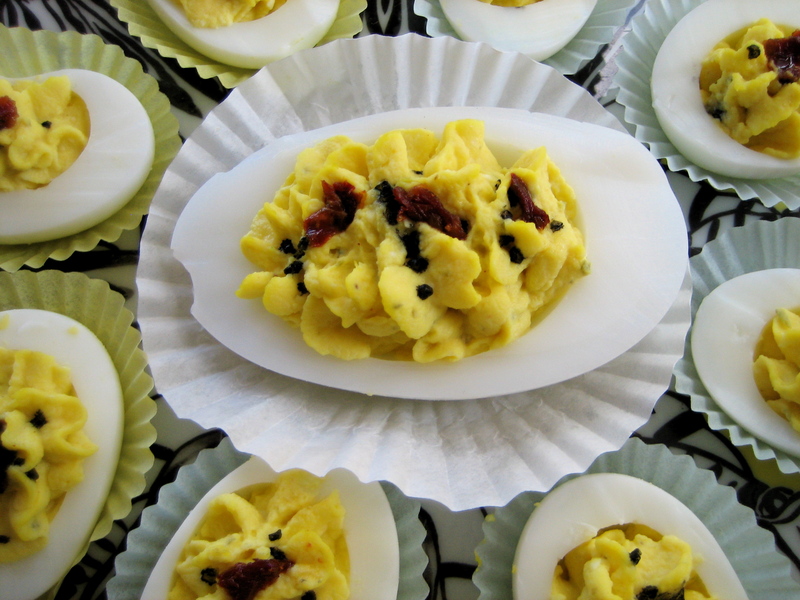 They started being called Deviled eggs in England in the 17th century. No comment. I have resistance to stuffed eggs because of the yolk’s cholesterol content. I’m an egg white girl. But, according to the American Egg Board, the opinions of the experts have changed recently— so you can eat yolks with restraint. Place chicken eggs in a single layer in a large saucepan, cover with cold water plus one extra inch. Carmen called to tell me that if you put one tablespoon of white vinegar into the water, the eggs peel easily. Where was she when I was trying to peel that goose egg? Heat over high heat just to boiling. 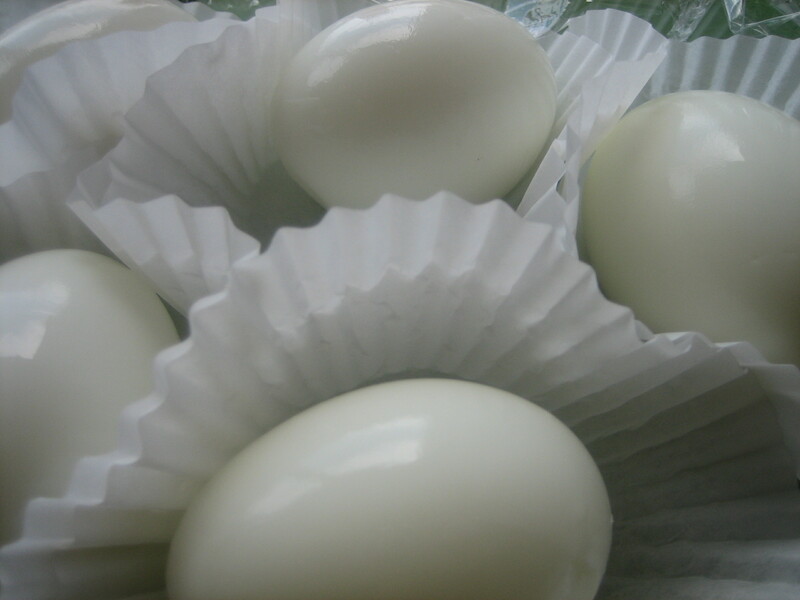 You do not want to boil the eggs, boiling causes the discoloring green rim, meaning overcooked! Cover pan and let the eggs stand in the hot water about 20 minutes, they continue to cook, a little longer for larger eggs. 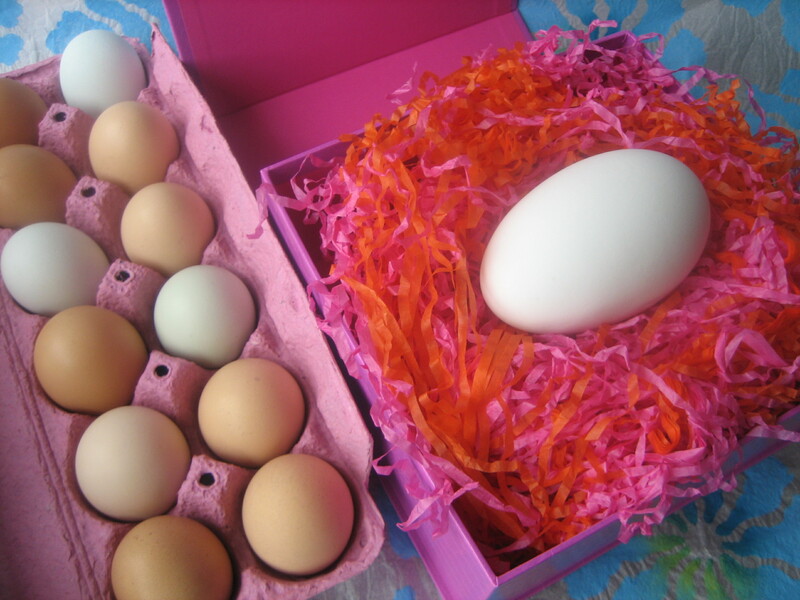 Goose Eggs follow directions for chicken eggs—except—cooking time is longer. Let the goose eggs stand after bringing to a boil for about 25-28 minutes. Drain under cold running water immediately or in ice water. Break the shell on the side of the sink or countertop all over and start peeling from the largest end where the air pocket is. 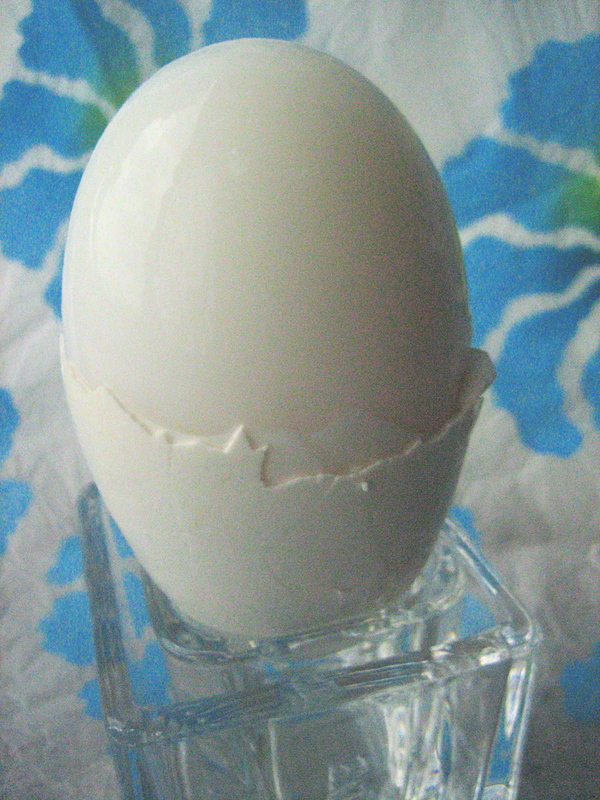 I learned that the fresher the eggs the harder to peel, the shell membranes stick to the shell. Then refrigerate on paper towels in a covered container. When ready, slice eggs lengthwise, remove the yolks. In food processor place egg yolks, Vegenaise, dry mustard, salt, cayenne, shallots, pickle relish, and pulse. Put mixture into cake decorating bag, star tip. Fill egg white halves. Garnish with black salt, and slivers of sun-dried tomato in oil. Tags: Deviled Eggs, Deviled Goose Egg, Farmer's Market, Inspiration, Italian Cooking, Party Appetizer, Photography, Recipes. Bookmark the permalink. Cool- Talk about the Goose that laid the Golden Egg. Great for an easter egg hunt. I agree with Kris, Eggcellent ideas and photography! Corny and funny…you’re the best! Those eggs and how you prep them are amazing! i love how you really bring out the best of each season and each holidays! I may try the devil egg recipe soon. Looks easy and fun to do.